This is one phone you won't want to drop. 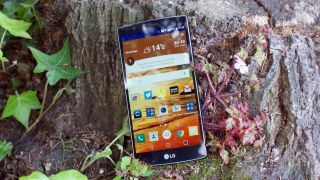 There are few things nobler than the humble drop test and recently the LG G4 has had its chance to shine, or shatter. In a durability test carried out by TechRax the LG G4 was dropped from a height of five feet onto hard ground. First it was dropped on its side, which left visible damage to one corner of the phone, but the screen and back cover seemingly got away fine. That escape was short lived though, as in a second test it was dropped screen first and this is where things go predictably poorly for the LG G4. The screen shattered and the leather back cover flew off, but despite that the display still actually worked. Our advice to LG G4 owners is simply don't drop it. So it wasn't the best result but it was an improvement on the LG G3, which in a similar drop test was left with an unusable screen, so that's progress of a sort. A fall is nothing, we want to know if phones can survive in space.